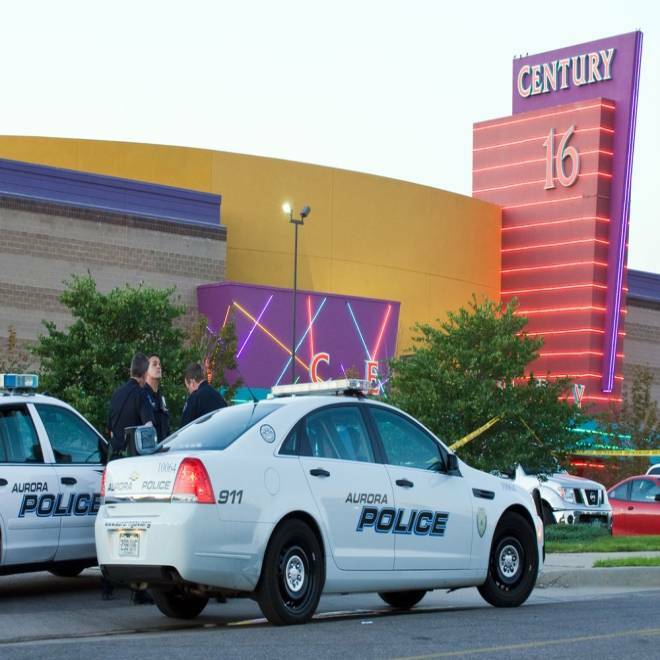 The scene in front of the Aurora, Colo., theater on July 20 where a gunman opened fire during the opening of the Batman movie "The Dark Knight Rises." Calling it a “disgusting offer” and a “thinly veiled publicity ploy,” some victims’ families of the Aurora, Colo., theater massacre are outraged that the movie house chain's owner would invite them to a special event marking the reopening of the place where 12 movie-goers were killed and 58 wounded. Cinemark CEO Tim Warner offered free tickets to an event Jan. 17 for the reconfigured Aurora Century Theatre, according to an invitation letter sent to Aurora Mayor Steve Hogan and obtained by NBC News. Warner also points out the community had requested the theater's restoration. In addition, victims and their families were told special arrangements could be made for them to visit before the reopening, on Jan. 15 and 16. According to the Denver Post, an email invitation was also sent through the Colorado Organization for Victim Assistance. It said that counselors would be available at the event. In response, a group of families fired back a letter of their own, blasting the invitation and saying they would urge a boycott of the event on social media. The letter says Cinemark had not reached out to families before the invitation. "None of us received a letter of condolence or any other communication from Cinemark, but now they want us to step foot in that theater," Sandy Phillips, mother of Jessica Ghawi, told The Denver Post. Ghawi was one of the people fatally shot during the sold-out midnight showing of the Batman film "The Dark Knight Rises" on July 20. “We, the families, recognize your thinly veiled publicity ploy for what it is: A great opportunity for you to distance yourselves and divert public scrutiny from your culpability in this massacre,” the letter states. A survey conducted this summer by the city of Aurora found the majority of residents in favor of having the theater reopened, the Post reported. It was remade into an XD theater with wall-to-wall, ceiling-to-floor screen. Several victims’ families have sued Cinemark USA, alleging improper security at the theater on the night of the massacre. A spokeswoman for Cinemark told NBC News the theater would have no immediate comment on the boycott. James Holmes, a 25-year-old former neuroscience graduate student, is charged with multiple counts of murder and attempted murder in the shootings. On Wednesday prosecutors said they would make public evidence in the case for the first time in a hearing next week. At previous hearings, a defense lawyer has said Holmes suffered from an unspecified mental illness.